Well February sure disappeared before I knew it! 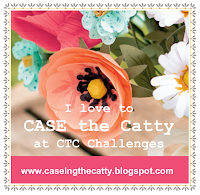 What better reason to blog again, than to participate in the CASE-ing the Catty (CTC) Challenge! I love the Stampin’ Up! catalogues and love that CTC is all about CASE-ing the awesome projects that are included in all the catties. You can check out the CTC Challenge page by clicking on this image. It’s Challenge #21 and this week the challenge is to ‘CASE’ something from the Every Day section of the Occasions Catalogue (pages 18-33). You can CASE (copy and share everything) a project and put your own twist on it, or use a sketch/layout, colour combo, embellishment, just to name a few examples, as a springboard for your own creations. The design team have provided some super inspiration – check out their projects on the challenge page. I loved the whole piece of Painted Blooms DSP in the large frame and loved the little flags on the small frame, and then I read the underlined text on the page and the plan for my CASE was hatched! The Painted Petal Suite is simply Scrumptious – and that’s hefty praise coming from someone who is not really a flower person – I know – shock horror! I just love how this all co-ordinates – of course that’s the intention … but I can still be impressed … can’t I? I used the Spring Flowers Embossing Folder to give my frame an ‘aged’ look, hung my banner on the Painted Blooms Cotton Twine and stamped some flowers from the Painted Petals stamp set on the inside of the card. Did you notice the two colours in my sentiment? I used one of my favourite Stampin’ Up! items to achieve this – my Stampin’ Write Makers. It so easy to colour directly onto the stamp with the Stampin’ Write Markers and get all sorts of cool effects. I was so happy with how this turned out that I decided to make some more and use them as my thank you cards for those who have ordered with me last month. It’s like a garden of thanks! As always – if you wish to know anything more about info in this post, or to get a catalogue or to buy any of the items mentioned in the post, please contact me. If you would like to find out about joining my Stampin’ Up! Team (thINK Creative) – get in touch – I would love to chat to you about that. You can receive my Blog Posts directly by email or join my monthly Newsletter group – you can subscribe using the buttons at the right of my page. Thanks Nikki 🙂 I really got on a roll with these after I made the first one. Thanks Rachel 🙂 In fact it’s not the base that’s embossed – it’s a separate piece that’s laid over the DSP to make the frame. I do love adding the texture you get from the embossing folders. Oh my you have been productive. So glad you decided to get inspiration from the catty to launch your garden of thanks. Thanks for joining us at CTC. Love the textured frames too. That’s a pretty neat CASE you’ve done (love the group shot!). I did like the way you’ve embossed the base, gives it such nice texture. Thanks for joining us at CASE-ing The Catty.